Med Couture Med Tech Zip Jacket. Water resistant jacket. Contrast color blocking at collar. Contrast back neck facing. Zip closure and side zip pockets. 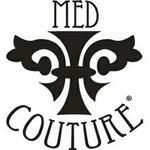 Med couture logo zipper and zipper pull.